Google hates spam, but loves quality content – as Matt Cutts reminds us every 5 seconds. We may all be familiar with article marketing, onsite content marketing, link baiting, and things of a similar nature . . . but they’re a lot of work. I’m about to make it easy by combining all three. I like to call it the “Content Resource Center”, or CRC for short. Why make a Content Resource Center? The motive is simple – to get traffic and site conversions by ranking highly for industry/niche keywords. The process involves writing unique and compelling content that is centered on the right keywords. This content should provide valuable information to your current site visitors as well as those hitting your site for the first time from search engines. The first step in making a Content Resource Center is to identify the best short-tail and long-tail keywords and/or variations to rank for, based on search volume andcompetition. If you’re running AdWords or Bing Ads PPC you’re already one step ahead of the game by being able to use data from your keywords, such as conversion rates, bounce rates, etc. That’s a pretty high number. Ideally you want less than 5000 to have a better shot at simply writing an article and ranking for it. Does that mean you shouldn’t go after that keyword? That’s for you to decide. 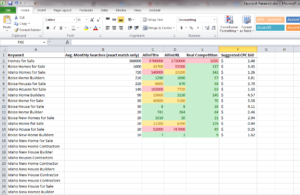 This article is about successfully ranking for less competitive keywords. 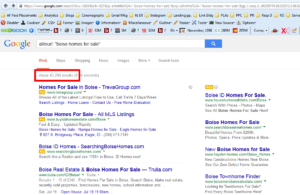 The search AllinURL: “Boise Homes for Sale” shows that there are around 55,000 pages Google has indexed with that phrase in the URL, which is also quite high. 5000 or less is better. This data lets us see roughly how many pages Google feels is relevant to a given search term. I’ll explain this in more detail later on. Sometimes I take the time to analyze the quality of sites that are already ranking on page one to see how legitimate they are. If they seem reputable, I’ll often check their backlink profile with RavenTools to see how strong their site is. Usually, the keywords I come up with for this whole process are long-tail enough that I completely skip this whole step. There are a lot of steps, so follow carefully! From the example I’m using in this article, the first article I’d write about would be “Boise Home Builders”, since it has a couple hundred exact match searches per month on average but lower levels of competition. Another thing to note is that the approximate cost per click for an exact match of this keyword would be $3.81, so it’s actually a pretty good opportunity to organically rank highly for a keyword that other companies may be paying $4 per click for. 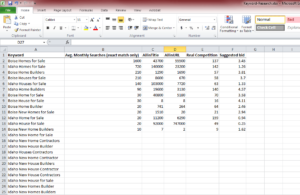 The three keywords on my spreadsheet with more search volume are infinitely more competitive and would likely be much more difficult to write an article and rank for. Something to consider: Just because a keyword has high search volume and low competition doesn’t mean that it will convert well on your site once you rank for it. Now that you’ve identified your best-chance keywords, and written and styled your articles, it’s time to post them on your site. Your Content Resource Center should have an index page with snippets of some or all of your articles and some type of navigation to make life easier for your visitors. This can be achieved by categories instead of only relying on pagination as you really start writing a lot of articles. If you’re using a blog-style CMS such as WordPress or similar simply add all your articles as posts and categorize them using the CMS’s native category structure. I’m just going to recommend basics on this topic. Use the exact keyword and/or variations in your URL, title tag, Meta description, H1’s and H2’s. Add at least one image and possibly also a video. Add the keywords and variations in a tasteful way to your image title and alt text, and potentially do an internal link to the article from another page or article on your site. 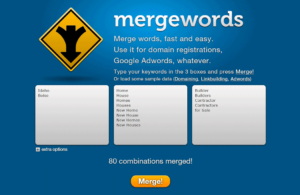 Check your keyword rankings with your favorite rank checking tool. I prefer Advanced Web Ranking. You’ll find that many of the keywords will start ranking well right away if you’re lucky (and I find that I regularly am). Some pages might even rank in spot 1 as soon as they get indexed. For other keywords, you can start a link building campaign and should be able to rank any of the low competition keywords with 1-2 legitimate links. This same strategy can be used on blog posts, city or state service pages (Louisville Termite Control, etc. ), or anything else that is relevant and not overly spammy. Now you get to sit back and watch what happens. If all goes well, you’ll start raking in the visitors and have them complete your call to action faster than ever before. Good luck, and leave any questions or comments below. Mike Murphy is the Director of SEO at Red Olive Design based out of Sandy, UT. His Salt Lake City SEO Team includes SEO, PPC, and Social Media Rock Stars that drive traffic and conversions for many awesome local and national companies. He is originally from Kentucky and had his first taste of internet marketing in the late nineties when he also built his first site with AngelFire.